Hootsuite is a Vancouver based company that’s primary product is scheduling software and analytics reporting for Social Media platforms. Hootsuite’s products help businesses streamline their Social Media marketing efforts bringing everything from multiple platforms into one easy-to-use, yet extremely powerful, dashboard. Recently Hootsuite was named a leader in Social Media management solutions by an independent research firm. Not only does Hootsuite allow you to schedule and monitor your posts it also allows you to respond to comments, posts, and messages all without leaving their platform. No more logging into 3 or 4 accounts to respond to messages – now you can do it all from 1 platform. One word – Convenience! 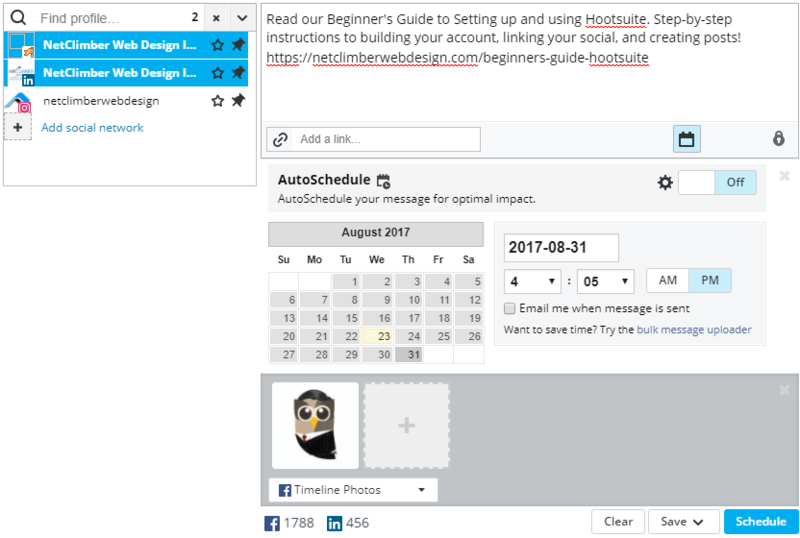 Hootsuite allows you to schedule posts, comment, and manage your social media accounts from a single dashboard. Personally the ability to schedule posts on multiple platforms to publish at the same (or varying) time easily and efficiently is the biggest draw for this product. Sure there are lots of products that do the same thing Buffer, Sprout Social, Everypost, and many more; however, Hootsuite is the industry leader for a reason and that is because they are the best at scaling with your business as it grows and integrates your data across many platforms from sales software, CRM, analytics and more. One of the best things about Hootsuite is they offer a free version. Although it is drastically “dummed-down” in terms of capabilities for a small business it is perfectly fine. It allows you to post, comment and message in up to 3 social accounts. 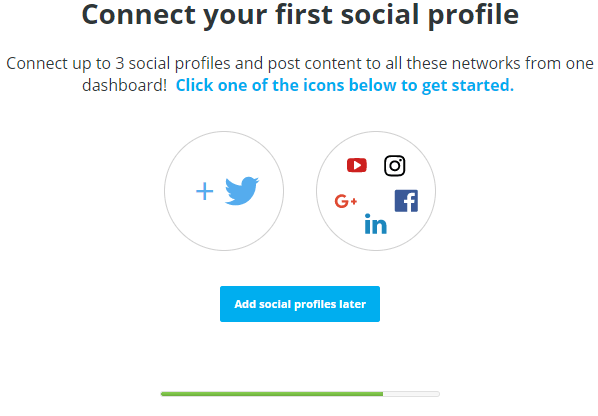 Next you will be required to connect to a social media account, there is no need to verify your email address with Hootsuite. 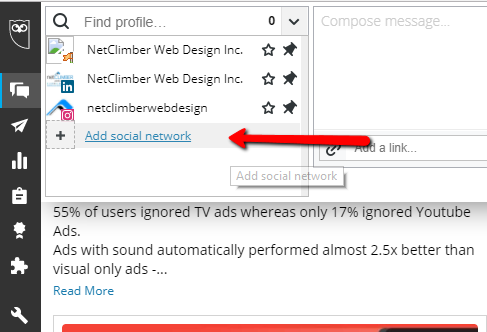 Connect to a specific Social Media channel by selecting the appropriate channel and following the prompts. This will include signing into your social media and giving Hootsuite permissions to manage your page on your behalf. 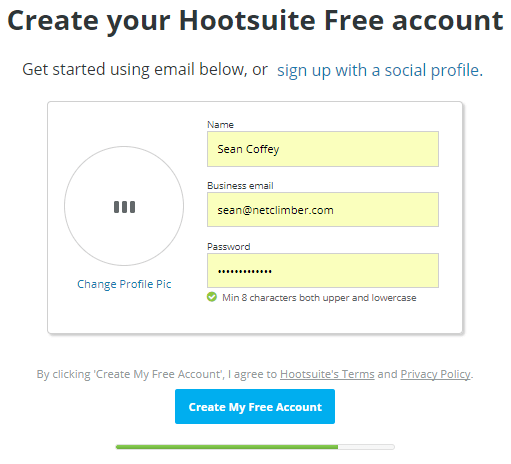 This connection allows Hootsuite to publish for you – accept the permissions they are requesting. 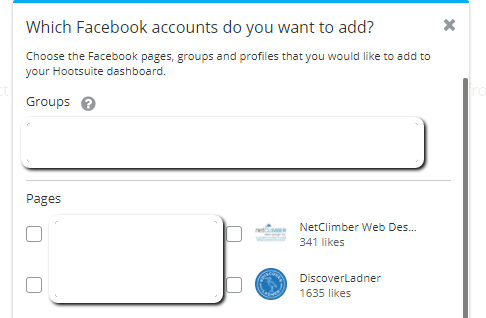 Next, select which page or group you would like to use Hootsuite for and select done at the bottom of the page. 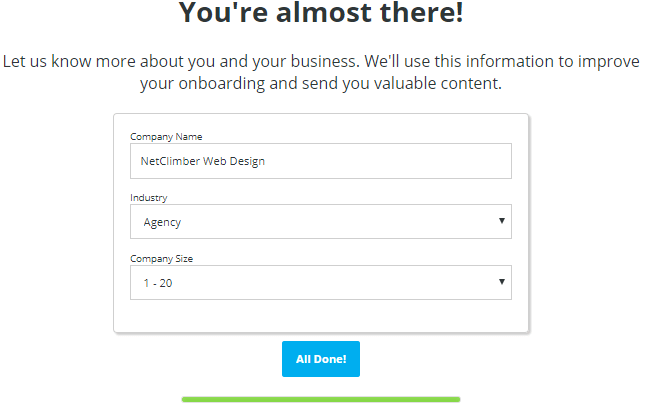 Lastly, enter some basic information about your business – this helps Hootsuite understand their customers and their needs, as well as offer you personalized solutions as you grow into a paid account (they hope, although the free version should fit the needs of any small business quite well). Voila! Your account is now created and you are able to start posting to any social media you have linked. A stream allows you to quickly and easily monitor a particular social network. 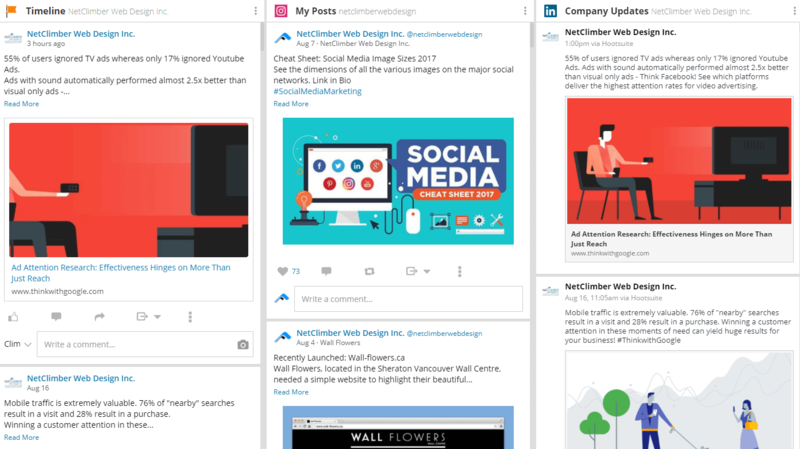 You can see your latest posts on Facebook, your latest mentions on Twitter, or upcoming posts to LinkedIn. In addition you can also respond to messages and comments directly from your stream without ever logging into the Social Network. To create a stream simply click add stream on the right side of the dashboard. 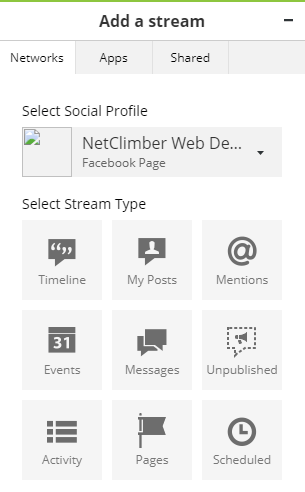 From there you can select the type of stream you want – Timeline, Posts, Mentions, Messages, etc. Once added the streams will look like the following – we have it set up to show us the latest posts from all 3 of our Social Media channels. Now that you are all set up you are ready to create and schedule your first post. There are currently two ways to do this in Hootsuite therefore, I will cover both. This is the original way to create posts in Hootsuite. At the top left of the dashboard there is a small box that reads “Compose message”. If you click this a text box will expand – this is where we are going to create our post. Below you can see a message that has been crafted. I have selected my social networks from the dropdown on the left, written in my text, added a link, selected an image from my computer, and am now ready to schedule. Please note that the “add a link” box to the left of scheduling allows you to shrink your URL to an ow.ly shortened URL – with tracking abilities. Scheduling gives you two options. 1 – AutoSchedule – this is where you let Hootsuite automatically schedule posts for you for optimal impact. The settings for AutoSchedule (such as within certain hours or days of the week, or how many posts/day) can be changed by clicking the gear to the left of the on/off button. The second way is to manually choose a date and time. Then click schedule. Voila! You have just scheduled your first post on Hootsuite. The composer is a relatively new product Hootsuite has added and is currently in the Beta testing stage, however it has considerable promise. It allows a user to see exactly how a post will show up in the selected Social Networks. To use composer simply click the Composer button on the top right of the Dashboard. Here is how the same post looks in the Composer interface – notice the preview on the right side. In addition to a preview the composer also has a vast library of free-to-use stock imagery and integrated image editing software. This can be accessed through the creative cloud link next to the image. Once you are happy with the way your post looks you can choose a date and time to publish, schedule, then you are done! Now to save lots of time!! Congrats! 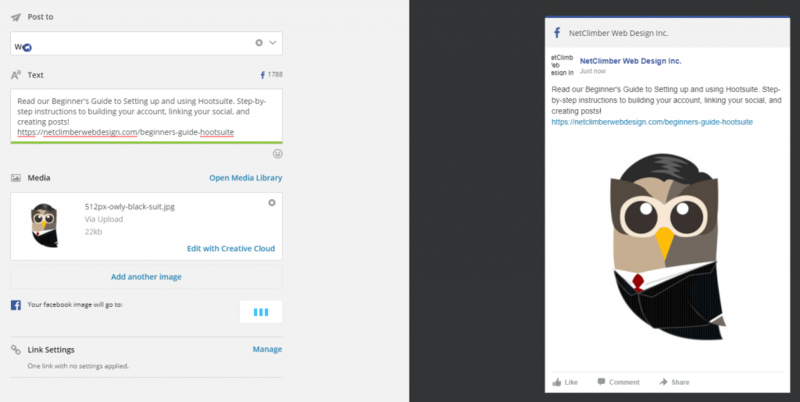 you now are able to schedule posts using Hootsuite. This will save you loads of time. Sit down once per week, month, or even quarter and schedule all the posts for that period. Log in to see all the messages your channels have received and respond accordingly, all in one place. Note: You can download the Hootsuite App on iOS or Android and schedule posts directly from your smartphone! Still looking for some more help? Contact us and we would be glad to guide you through the process!